Students and small business professionals alike will appreciate the power and flexibility of the Satellite R25-S3503 convertible notebook, allowing them to work with a traditional keyboard or rotate and fold the screen down for use as a Tablet PC with digital pen-based input and control. A digitizer pen allows the user to handwrite notes, draw, edit copy or write e-mail or input data while standing, sitting or reclining. It can convert handwriting to text or just record your own handwriting. The 14.1-inch Tablet display roughly simulates the writing area of a standard 8.5- by 11-inch sheet of paper to provide optimal room for note-taking and drawing. For the first time in a Toshiba Satellite convertible notebook, the Satellite R25-S3503 offers Intel(R) Core(TM) Duo Mobile Technologies, docking capabilities as well as Toshiba's exclusive LifeSmart Technology(TM)(1), a set of features that elevate system performance, durability and security with shock-absorbing technologies(2) to protect the hard drive, a spill-resistant keyboard(3), and fingerprint security. 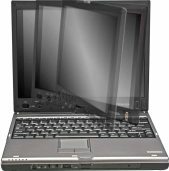 Starting at 5.95 pounds(4), the Satellite R25-S3503 features a 14.1-inch diagonal widescreen TruBrite(TM) LCD display, the Intel Core Duo Processor(5) T2050 and the Microsoft Windows XP Tablet Edition 2005 operating system. The inclusion of the latest Intel Centrino(R) Mobile Technology enhances overall system performance from graphics to wireless capabilities while reducing power consumption. each model individually for included LifeSmart features. limitations apply. Visit www.warranty.toshiba.com for details. conditions are available at www.warranty.toshiba.com. I had a chance to try this model with the dual core processor, but unfortunately, it only came with 512Mb of ram. The first thing I did was to install Windows Vista on it. The AeroGlass worked immediately and I can definitely see why anyone getting a new computer would want AeroGlass available. For photos, take a look at our Reviews page. Standard options include 512Mb ram and a CD-RW built-in drive. This is certainly a Tablet worth considering for all your computer needs. Designed to build upon Toshiba’s highly successful Portégé M200, this new convertible Tablet PC is rich in performance and productivity innovations—including the company’s EasyGuard™ technology 1 —to create an ultra-portable Tablet PC capable of running today’s robust business applications. The Portégé M400 gives Toshiba the industry’s widest range of Tablet PCs options from a form factor, performance and price point prospective. professionals. This is the base configuration, but there are many options available, including dual core processors, up to 4G of ram, a DVD-RW, up to a 120G hard drive and many more. For the full list of specifications, check our Comparison Charts or Toshiba's list of options. Communications: Intel ® PRO/Wireless Network Connection 3945ABG (802.11a/b/g)3 . 12 Warranty. The terms and conditions of Toshiba’s standard limited warranty, extended warranty and service upgrade terms and conditions are available at www.warranty.toshiba.com. The Tecra® M7 is the premier high-performance Tablet PC for mobile users that demand the increased productivity of a Tablet PC, bolstered with the Toshiba's exclusive EasyGuard™ Technology* feature set that boldly elevates system performance, reliability, and security. Whether users are at the desktop or beyond, Intel® Centrino® Duo Mobile Technology* powers the Tecra® M7, allowing users to better experience the greater flexibility of Tablet PC and laptop computing. The turn-style transformation from laptop to Tablet PC with digital ink helps boost the visual experience of the world's first 14.1" WXGA+ [1440x900] display with Tablet to multimedia levels.